DURBAN, South Africa, December 11, 2011 (ENS) – As dawn broke over Durban this morning, climate negotiators agreed to launch a new legally-binding treaty limiting greenhouse gas emissions that would apply to all 194 member governments of the UN Framework Convention on Climate Change. 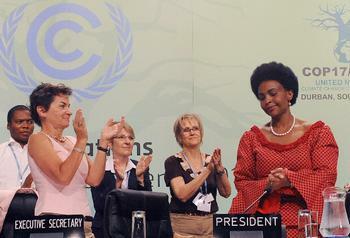 They also approved a second commitment period for the existing Kyoto Protocol and the launch of the Green Climate Fund. The final package of agreements, known as the Durban Platform, was reached after intense negotiations that extended until 5 am this morning, more than a day past the official end of conference. UN Secretary-General Ban Ki-moon today welcomed the outcome, saying these decisions represent “a significant agreement that will define how the international community will address climate change in the coming years. The new “agreed outcome with legal force” covering all countries must be negotiated by 2015 and take effect by 2020 at the latest. It must ensure that countries take measures sufficient to meet the goal agreed at last year’s climate conference of keeping global temperature rise below two degrees Celsius over pre-industrial levels, which many scientsts say could avert the worst impacts of climate change. Work on this instrument will start immediately under a new group called the Ad Hoc Working Group on the Durban Platform for Enhanced Action. Parties to this second period will turn their economy-wide targets into quantified emission limits or reduction targets and submit them for review by May 1, 2012. “This is highly significant because the Kyoto Protocol’s accounting rules, mechanisms and markets all remain in action as effective tools to leverage global climate action and as models to inform future agreements,” said Christiana Figueres, executive secretary of the UN Framework Convention on Climate Change. Countries also agreed to implement the Cancun Agreements, which were created at last year’s conference in Mexico. The new measures include setting up a Technology Mechanism that will promote access by developing countries to clean, low-carbon technologies, and establishing an Adaptation Committee that will coordinate adaptation activities on a global scale. Ban applauded the launch of the Green Climate Fund and said he was gratified that a number of countries signalled their intent to contribute to it. The Fund was created last year to help developing nations protect themselves from climate impacts and build their own sustainable futures, but had not been launched. 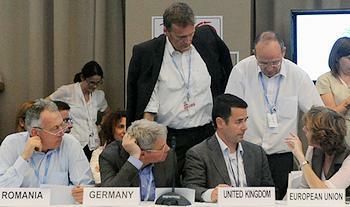 Ban had urged developed countries throughout the two-week conference to inject the necessary capital to kick-start it. “This means that urgent support for the developing world, especially for the poorest and most vulnerable to adapt to climate change, will also be launched on time,” said Figueres. 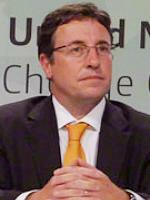 Achim Steiner, executive director of the UN Environment Programme, is encouraged by the agreements but said the real-world impact on the planet’s climate is still uncertain. The latest “Bridging the Emissions Gap” report, coordinated by UNEP with climate modeling centers around the world, emphasized in November that the best available science shows that global greenhouse gas emissions need to peak before 2020. The key question of the Durban outcome, said Steiner, is whether what has been decided will match the science and lead to a peaking of global emissions before 2020 to maintain the world on a path to keep a temperature increase below two degrees Celsius. The United States has not signed on to the Kyoto Protocol, concerned that it does not cover high-emitting developing countries such as China and India. A big question in Durban was whether the United States, China and India would agree to be legally bound to limit their greenhouse gas emissions. In the final vote, all three countries did agree. Although the Durban Platform sets the stage for a legally-binding agreement that does cover all countries, the U.S. supported it only reluctantly. U.S. 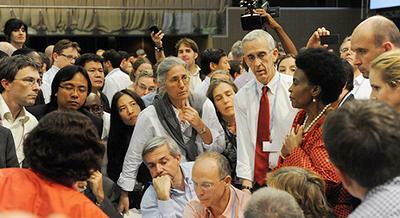 Climate Envoy Todd Stern told delegates, “This is a very significant package. None of us likes everything in it. Believe me, there is plenty the United States is not thrilled about.” But he said the agreement formalizes important advances that would fall by the wayside if it had been rejected. “We made it. EU’s strategy worked. We got a roadmap that marks a breakthrough for international fight against climate change,” tweeted EU Climate Commissioner Connie Hedegaard of Denmark, who chaired the 2009 UN climate conference in Copenhagen. The world’s largest environmental group, the International Union for the Conservation of Nature, expressed optimism over the progress made in Durban. “A new spirit of compromise spanning the developed and developing countries is an encouraging step forward,” said Maginnis. But other environmental groups warned that the Durban Platform is just another delay of effective climate action. “Some countries here, like the United States, showed they were not interested in supporting an ambitious outcome in Durban. The U.S. – afraid of the politics at home – fought over a few words, but missed the bigger story: limiting dangerous climate change,” Smith said. “Overall, the responsibility for this lies with a handful of entrenched governments – like the U.S., Japan, Russia, and Canada – who have consistently resisted raising the level of ambition on climate change. This is what brought us to this point. 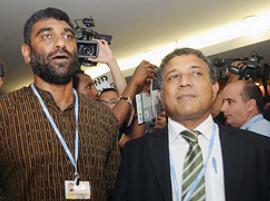 The next annual UNFCCC Climate Change Conference is scheduled for November 26 through December 7, 2012 in Qatar.